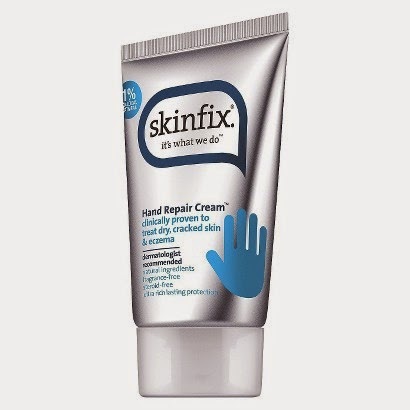 If you have chronically dry hands and/or eczema, Skinfix Hand Repair Cream is going to be a god send for you this Winter. This cream is by new skincare brand Skinfix, created with very dry skin and eczema in mind. But I was pleasantly surprised to find that the formula is quite lightweight and creamy - not too thick, greasy or oily. It's very concentrated, so I rarely needed more than a dime-sized amount for both hands. Immediately upon application, the cream had a bit of a cream/gel-like texture, and then sank into my skin and nails. The finish on my skin had a light sheen and there was just a touch of a oily feel to my hands afterwards, but that also gave way to baby soft, smooth hydrated hands after about another minute or so. The Hand Repair Cream has no artificial or added fragrance. Any scent you may notice when applying it comes from its natural ingredients. For me, a slight bit of a eucalyptus scednt is what I detected, but this dissipated quite quickly as well. *This product was provided courtesy of SkinFix PR for reviewing purposes.